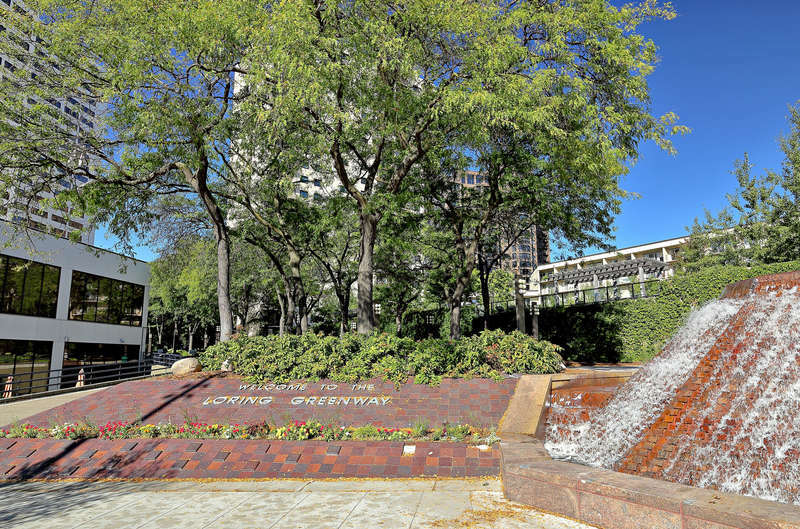 Entrance from Nicollet Mall is near 12th St.
By the 1960s, the once fashionable Loring Park area had become run down. In response, both the Minneapolis City Council and the Downtown Council (a business leaders’ group) put forward plans in the early 1970s that emphasized the potential for high density residential redevelopment around the park. The city council’s plan created the Loring Park Development District, the centerpiece of which was the Loring Greenway. Fueled by tax-increment financing that effectively limits private developers’ risk, dozens of condominium and apartment buildings have been built that provide homes for thousands of people with a wide income range. An important part of landscape architect M. Paul Friedberg’s strategy for the Greenway was to complement the dwelling units with a lush park-like environment that would compete with the suburbs. This worked splendidly. A walk on the Greenway feels like a walk in the woods. The trees team up with the high-rise buildings to make the Greenway a quiet and shaded place. But because pedestrians know, consciously or unconsciously, that people in the surrounding buildings may be watching, the feeling is one of cozy safety rather than danger. Loring Park and the Greenway are named for Charles M. Loring, one of the city’s most far-sighted and generous philanthropists. After building the city’s flour-milling industry, Loring retired from business at age 47 in 1880 and devoted the rest of his life to civic concerns. Known as the father of the city’s park system, he established the first park commission and promoted the purchase of land for parks before those lands could be privatized. 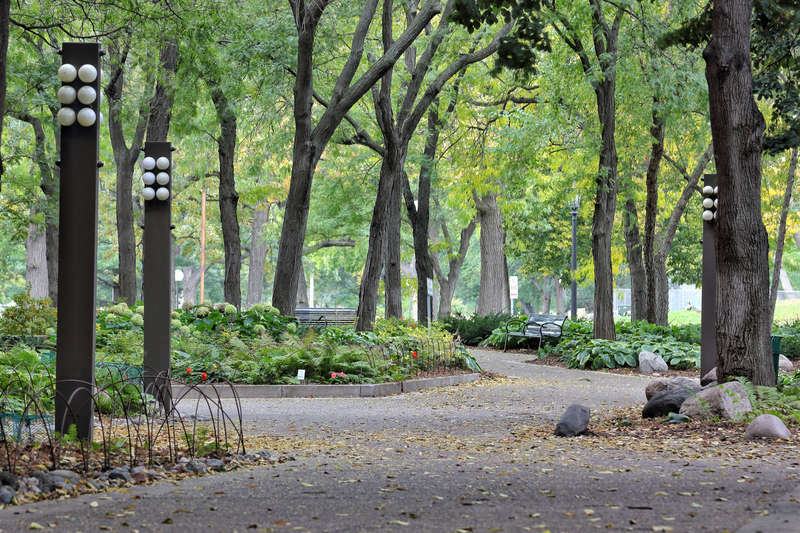 Today, 97 percent of Minneapolitans live within a 10-minute walk to a park. 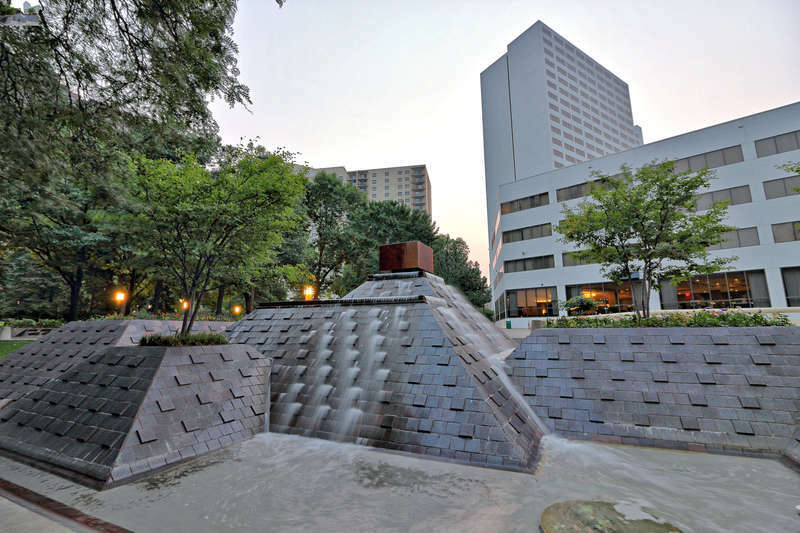 To a great degree because of Loring’s foresight, the Trust For Public Land has designated Minneapolis’s parks as the best urban park system in the United States every year since 2013. Richard L. Kronick & Lisa Middag, “Loring Greenway,” Minneapolis Historical, accessed April 18, 2019, http://minneapolishistorical.org/items/show/163.